There is a rule that I just came up with: Invisible Kids have lousy costumes. The original, Lyle Norg, had that brown-and-green workout outfit with the headband and all and poor Jaques up there has that yellow-and-black monstrosity. Heck, even the current, totally rebooted and up-to-date and not dead Invisible Kid looks like he just grabbed four or five random things from his closet and called it a costume. It's kind of like they want to be sure that their power will be appreciated every single time that they use it. "Oh, thank Space-God, Jaques. That thing was starting to sear my retinas." Jaques Foccart got to be the second Invisible Kid basically through random chance. He had come to Legion HQ to get Brainiac 5 to make his sick sister well and then Computo had shown up again and possessed said sister, possibly using nanotechnology. Since Jaques had no powers or anything, Computo just totally ignored him to focus on beating up Legionnaires and in the confusion our pal drank some of the original Invisible Kid's formula (that was just, you know, lying around) and saved the day somehow (it's been a while since I've read the story, okay?). Computer-tyrants take note: underestimate Frenchmen at your peril. Afterward, Jaques joins the team and does okay. Oh, and at one point he starts teleporting as well as turning invisible and ends up in some weird hellscape and finds out that poor Lyle Norg didn't end up boinking some ghost-babe for the rest of time but rather was suffering eternal torment, which was a bit of a bummer. I like that Invisible Kid II was named Jaques Foccart, because I was an English major and so occasionally read it as Jaques Focault, who would have the combined powers of Jaques Derrida and Michel Foucault, and have a giggle while I imagine him deconstructing the semiotic of the super-hero team (or something like that. I was an English major a while ago). Also, he's from Côte d'Ivoire and as far as I know is the only superhero ever to come from there. Dammit, except for his sister, eventually. This picture, however... eesh. I kind of hope that it was accidentally released unfinished, because invisibility is really the easiest power to illustrate ever. 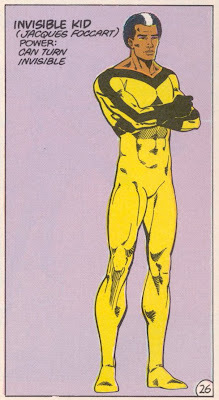 Just make the outline of his legs dotted instead of solid about halfway down and then ask the colourist to fade out the yellow at about that point. Ta-da! You did it! Alternate method: leave the whole panel blank. As it stands, this is just terrible as a showcase for the character. I mean, when Superman has a shot where he's just standing there with his arms folded, he's at least hovering a foot or so off the ground, right? Take some notes, Jaques. Invisible Kid II had two modes: brooding and surprised. In the first, he thought a lot about how his sister was sick (she was in a tube for a couple of years before Brainiac fixed her) and how invisibility was a lame power, which showed that he didn't think about the implications of having superpowers so much as read old Maxim articles about lame super-heroes. Don't listen to them, man! Sure you can't fly through the sun, but the sun's boring. You can fly through, say, the changing rooms of the stars. Plus, you can punch villains on the back of the head, which I for one have always wanted to do to Universo. In the other mode, Jaques shocased the fact that he wasn't a super-scientist or an adventurer or something, just some guy who had drank some goop. Every time that Validus or Darkseid or whoever would show up he would jump about a foot and shout "WTF!" Okay, he would shout "Sacre coeur!" but the spirit of the thing was the same. For me, it never got boring.